Special Tasting Events at the Epcot International Food & Wine Festival | What's the Point? 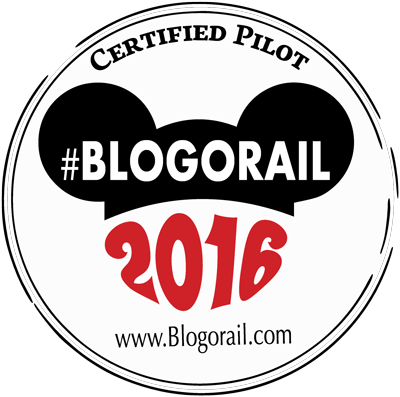 Welcome to this month's Blogorail Red Loop. Today we are sharing what you need to know to get ready for the Epcot International Food & Wine Festival. The Epcot International Food and Wine Festival is not to be missed for so many reasons: the Eat to the Beat Concert series, the opportunity to sample delicious food from around the word, the exotic drinks, and so on. But did you know that there's more to the festival than sampling from the booths and seeing shows at the America Gardens Theatre? Italian Pairings with Wine Versus Beer - At Via Napoli Ristorante e Pizzeria, have a delicious lunch including specially chosen craft beers and fine wines to match the heritage of the dishes being served. Italian Regional Food & Wine Pairing Luncheon - At Tutto Gusto at Tutto Italia Ristorante, enjoy five courses of three dishes each, created with ingredients from across Italy. 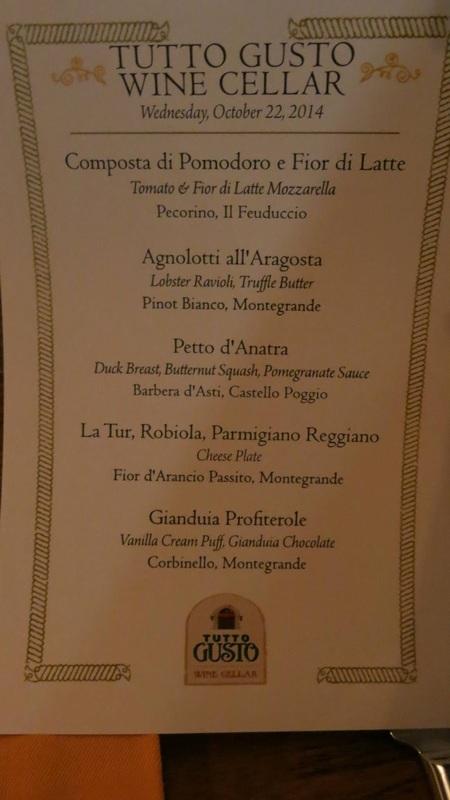 All 5 courses are paired with select wines from the Tutto Gusto cellar. Italian Food & Wine Pairing - At Via Napoli Ristorante e Pizzeria, enjoy a 4-course exploration of Southern Italy’s recipes and regional wines. Japanese Craft Beer Tasting - Outside at the Katsura Garden Deck, enjoy a flight of the best Japanese craft beers along with six Japanese dishes. Tokyo Pairing - At Tokyo Dining, enjoy three pairings of Japanese food with sake and Japanese craft beer. The Hibachi Experience - At Teppan Edo, a six course "show" and breathtaking food, each course paired with sake. Have your own personal chef at the table to explain cooking methods. Mediterranean Food & Wine Pairing - At Spice Road Table, enjoy Mediterranean and Morocco-inspired food from both the land and sea. 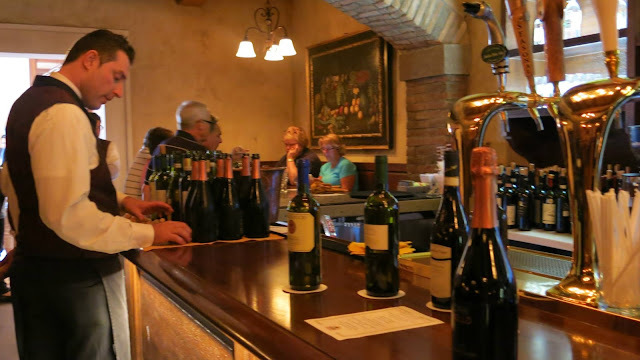 Includes wine pairings and a beautiful view of the World Showcase Lagoon. Moroccan Food & Wine Pairing - At Restaurant Marrakesh, sip wines that aren't commonly found in the United States while eating creative dishes filled with exotic spices and flavor. Parisian Breakfast - At Chefs de France, enjoy an authentic buffet of french breakfast selections. Most importantly, pair your baguettes with mimosas, coffee au lait or chocolat chaud. The Parisian Afternoon: Sandwiches, Macaroons, and Bubbles! - Just the title of this is enough to make me want to sign up. It is exactly how it sounds - petit fours, macarons, and unlimited mimosas. 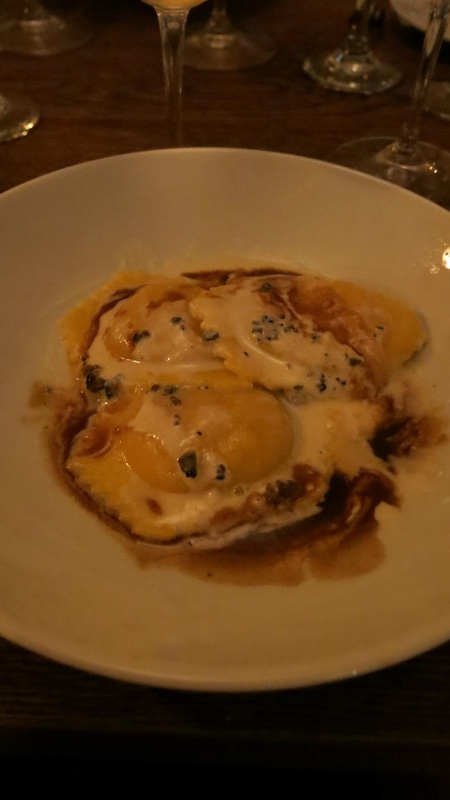 French Meal Traditions - At the fabulous Monsieur Paul, the amazing French chef's will rotate each week during the festival and create meals that their mothers and grandmothers used to make, paired with French wines picked specially by staff. What's Cooking With... - A brunch event with celebrity chefs including Buddy Valastro, Cat Cora and Carla Hall. IllumiNations Sparkling Dessert Party - Enjoy an international assortment of popular desserts and beverages while enjoying (my favorite) IllumiNations: Refections of Earth. Party for the Senses - First, enjoy the Eat to the Beat Concert series in style, in your reserved seats. Second, party all night while enjoying superb entertainment and food. Acrobats will entertain you while you sample from 50 plus food stations. Rockin' Burger Block Party - Enjoy specially created sliders while dancing along to a DJ. During the October 8th event, the block party will be hosted by the chef's from ABC's The Chew - my favorites! My parents had the privilege to attend the Italian Regional Food & Wine Pairing Luncheon last year and they told me that it was the single best culinary experience they've had at Disney and that it was "worth every single penny." Of course these events do cost extra and some of them aren't cheap. In fact the Hibachi Experience in Japan will cost you $150 per person. While some are significantly more reasonable, including the Parisian breakfast, I will say this: you get what you pay for. 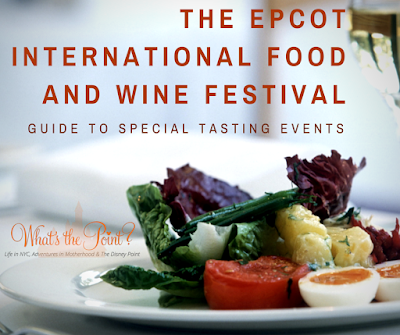 Visit the Epcot International Food & Wine Festival website for specific prices and dates. Remember, not every event is offered every day. Also, remember what you are spending just touring the booths. Each small item and drink will cost you $4-$5, so it adds up fast. Would you rather eat a six course meal with drinks or sample from the booths? The choice is yours and yours alone. 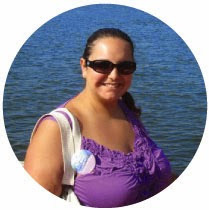 For more information Food & Wine Festival, check out the other great posts from the Blogorail!